How do I take the bus or CTrain? Need to get to a job interview or do some shopping? Getting around Calgary is possible using Calgary Transit, which offers a network of trains and buses throughout the city of Calgary. Visit calgarytransit.com to find routes and plan a trip. Download the YYC Transit app on your mobile phone. Type your destination or address in the “Search” bar to see a list of route options. In Google Maps, type your destination into the “Search” bar, then click “Directions”. Select the train icon for a list of recommended routes. Before getting on a CTrain your ticket must be stamped. Put your pre-paid ticket into one of the machines located at each train station – there will be a pink/purple slot for you to do this. It will stamp the ticket with the date and time. If you purchase your ticket from a machine at a CTrain station it will have the date and time on it already and you do not need to stamp it again. After the ticket is stamped you are allowed to travel for 90 minutes on any CTrain or bus in Calgary. After 90 minutes the ticket is no longer valid. If you are on a trip that involves switching to a train or another bus, you need to ask the bus driver for a “transfer”. Do this as soon as you have given the driver your ticket/paid to get on the bus. A transfer is another ticket with the date and time. If you get on another bus you will need to show the next bus driver your transfer so they know that you already paid. If you get on a train you may be asked to show your transfer as proof of payment. You have 90 minutes to use this new transfer, but when the time runs out you will need to use a new ticket. Most Calgary Transit buses and trains are accessible for people with disabilities. Call (403) 262-1000 to find out if your local bus stop is accessible. Once you learn these steps to taking the bus and CTrain in Calgary, getting around is easy. Simply show up at the train station or bus stop, pay your fare (in the machine for CTrains, and to the driver for buses), and enjoy your ride! Calgary has 2 train lines – the Red Line (201) and the Blue Line (202). 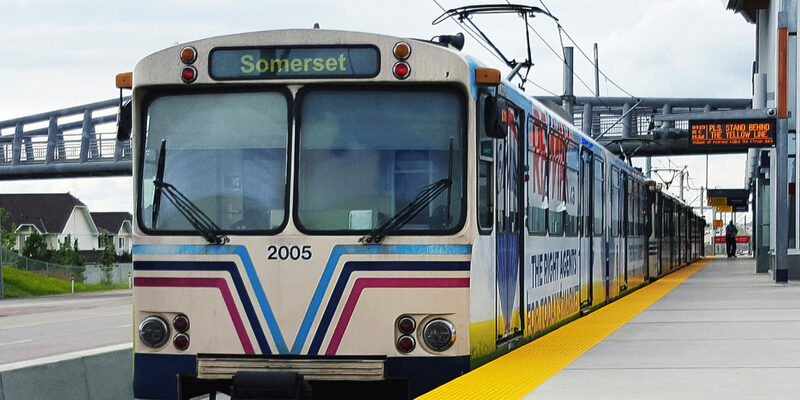 The Red Line travels from Somerset-Bridlewood in the far south end of Calgary to Tuscany in the far northwest, while the Blue Line travels from Saddletowne in the northeast to the 69 Street Station in the west. Travel through the downtown core is FREE at all times on both the Red Line and the Blue Line and you do not need to use a ticket. This includes the stations on 7 Avenue between City Hall and West/Kerby Stations. Thanks to Michelle Macdonald for help with this guide. If you want to suggest a correction to this guide, or want to submit one of your own, please contact us.